Interpretation of interstitial lung diseases is based on the type of involvement of the secondary lobule. The secondary lobule is supplied by a small bronchiole (terminal bronchiole) in the center, that is parallelled by the centrilobular artery. 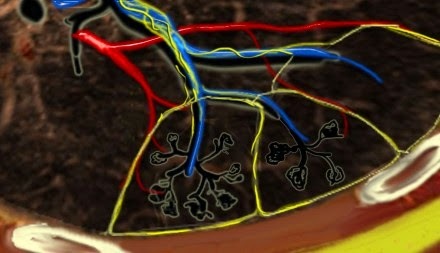 Pulmonary veins and lymphatics run in the periphery of the lobule within the interlobular septa. Under normal conditions only a few of these very thin septa will be seen. Centrilobular area is the central part of the secondary lobule. 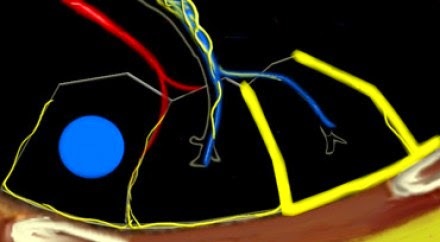 Perilymphatic area is the peripheral part of the secondary lobule. Are there additional findings (pleural fluid, lymphadenopathy, traction bronchiectasis). Common diseases like pneumonias, pulmonary emboli, cardiogenic edema and lung carcinoma are already ruled out. 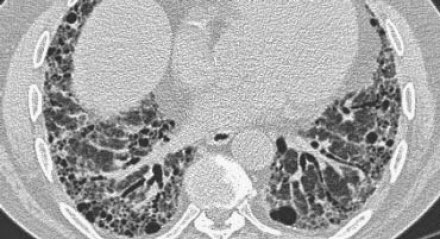 So uncommon diseases like Sarcoidosis, Hypersensitivity pneumonitis, Langerhans cell histiocytosis, Lymphangitic carcinomatosis, Usual Interstitial Pneumonitis (UIP) and many others become regular HRCT diagnoses.